My dad's favorite snack is popcorn. All through growing up he would have a bag of popcorn either in the afternoons on the weekend or after dinner during the week. He does this years later, after I've moved away. I'm glad my Daddy has never changed, but I have a new popcorn for him to try out. KuKuRuZa Gourmet Popcorn makes the most fabulous popcorn, and I know he'd enjoy it too! If you have a discerning palate and a zest for life, we have something for you. Crafting gourmet popcorn is a passion for us, and you won't find anything less than our best available every day. Nothing gives us more pleasure than finding the finest quality ingredients and transforming them into unique and delicious treats. Our goal is simple: to be the world's best gourmet popcorn company by providing our customers with the most delicious and unique gourmet popcorn varieties. Of the four flavors KuKuRuZa asked me to review for you, Tuxedo is my favorite. Imagine a chocolate and white chocolate combo drizzled over deliciously crunchy caramel corn. Yumm, I just made you hungry... Didn't I!!! Oh my goodness! The other flavors were super yummy too! They sent Brown Butter & Sea Salt, Chicago Style (Caramel Corn and Cheddar Cheese mix) and Hawaiian Salted Caramel along with the Tuxedo. To quote my husband while eating the Chicago Style, "This is the best popcorn I have ever eaten!" I'd say it was a hit in our home! The children were big fans of this popcorn as well! Cooper enjoyed the Hawaiian Salted Caramel, but required a lot of water. When you eat it you initially get the caramel flavor but the salt creeps up on you and is a very nice compliment. The Brown Butter and Sea Salt was a very soft popcorn but still right amount of crunch with a hint of butter and salt. 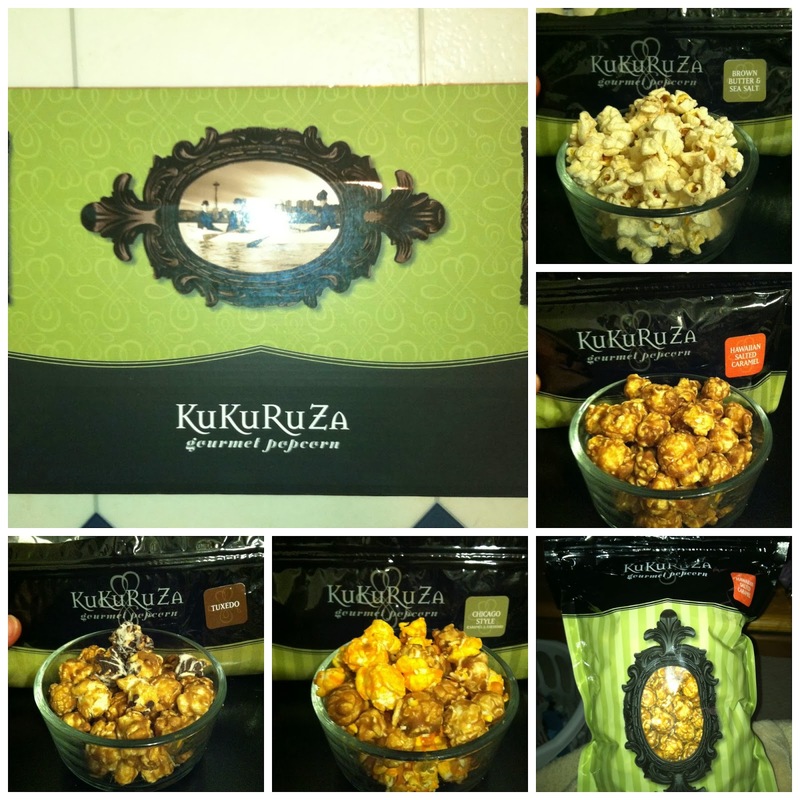 KuKuRuZa Gourmet Popcorn is simply delicious! With flavors like Cheddar Cheese, Rainbow Fruit, Buffalo & Bleu Cheese and Kettle Corn, you are sure to find one that fits you. I know my dad would be impressed.. I should send him some. While I'm at that, look them up online and on social media! Disclosure: A special thank you to KuKuRuZa Gourmet Popcorn for giving Sweet Cheeks and Savings this opportunity to work with them. We received these items free of charge from KuKuRuZa Gourmet Popcorn. No monetary compensation was received or offered, nor were we under any obligation to write about this product. All opinions expressed are honest thoughts. We were not offering any sales or taking orders for this item. We will not receive any compensation in connection with any sales of this item. This popcorn looks so delicious! We love popcorn in our family. Occasionally we'll even eat it as a meal! Thanks for info. I'll have to check it out! My Hubs has just started eating more popcorn. I bet he would like the cheddar cheese flavor... well, I know he would like all of them but I think the cheddar cheese would be his favorite. You had me at popcorn. Seriously, you didn't even have to say another word. I am a HUGE popcorn junkie!! I'm not a huge fan of popcorn, but my hubby is, and he would love this! Thanks for the introduction to this brand! I'm obsessed with Popcorn! I would love to try these different flavors. Popcorn is like my go to snack of all time. that looks soooo good! Flavored popcorn - especially caramel corn is a weakness of mine. I love popcorn and these look temptingly delicious! I really do not like the taste of salt so would probably stay away from the saltier ones. We are big popcorn fans at my house too and we always have to have some for our movie night. This one looks yummy and I'm a sucker for flavored popcorn, especially caramel. Yummm, they all sound good but the tuxedo popcorn really sounds delicious! For some reason I don't like buttered popcorn, but I love all the flavored popcorns. I will have to check this out, they look amazing! I haven't hard of KuKuRuZa Gourmet Popcorn before, but it sounds delicious! I would love to try their Rainbow Fruit or Buffalo & Bleu Cheese flavours! Thanks for a great review! I want to try the Buffalo Bleu Cheese - my kids would love the others. I am a big fan of flavored popcorn. These seems so yummy - haven't tried anything like that but its looking really good. We are popcorm freaks! I pop my popcorn in a pot. My hubs downs it like it's goin out of style LOL. I will have to check these out! I so love that, I had it in my subscription box last m onth and it's delicious! Popcorn is my favorite snack. It is also something that I love to gift family members. My elderly parents especially love gourmet popcorn. I will have to give this brand a try. Ok now i am craving popcorn this sounds and looks amazing we all love popcorn here. Popcorn is a nice quick snack. Flavored popcorn is even better. It looks so good! I don't like plain popcorn, it's always so much better when it's a little more gourmet! Yummy I love this stuff! Its like heaven in my mouth! I need more kukuruza!! I always prefer the savory flavors, so I would be all over that cheddar cheese. It sounds wonderful! These sound deelish!!! I love snacking on popcorn, too! The Rainbow Fruit sounds like it would be a hit in my house.